Experience the timeless history of Rome’s Colosseum and the glories of Ancient Rome during this half-day Colosseum tour. 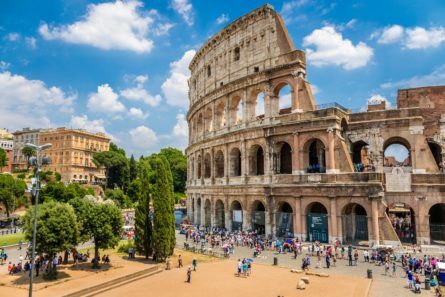 This spectacular Ancient Rome and Colosseum tour peels back the many layers of the Eternal City’s history, from the height of the Roman Empire through the Republican Age. At the Campidoglio, or Capitoline Hill, the most important of Rome’s seven legendary hills, we’ll jump right into our tour. During the days of the Republic, Rome’s first capital was located atop this hill and today many of the government offices are located here. Your private English-speaking guide will give you an overview of Campidoglio’s history and its Michelangelo-designed Piazza. You won’t want to miss out on the picturesque view of the largest open-air museum in the world: the Roman Fora. The true political, social and economic hub of Ancient Rome, see the Roman Fora in its untouched and original layout. Here, your guide will resurrect the glory of antiquity as you walk along the once bustling Via Sacra and see the ruins from the temples, Senate House and homes that dominated the area in Ancient times. Walking down the remarkable Via Sacra will take you back in time as you head towards one of Ancient Rome’s majestic ruins, the Colosseum, just as if you were on your way to watch the gladiator games, Ancient Rome’s most popular form of entertainment. Skip the lines to enter the architectural masterpiece and enjoy a Colosseum tour, reminiscing on thousands of Romans gathering to watch cruel fights between gladiators and wild animals. Continuing our tour, we will visit an open-air venue known as the Theatre of Marcellus, dating all the way back to 13 B.C. Observe a 16th century palace that served as a residence for the Orsini, an Italian noble family. Your guide will bring you to the Markets of Trajan, where Romans would purchase goods and carry out business. Built at the beginning of the second century A.D., the market consists of 150 individual stalls and is considered the first shopping mall in history! Public bathing was a daily tradition in Ancient Rome; the higher your social and economic status, the more luxurious your bath. We’ll visit the remains of the Baths of Caracalla, and visualize the massive rooms that would accommodate more than 1,600 people. Completed in 217 A.D., these are the best preserved and most impressive of the Imperial Roman baths. Next, we head to the Circus Maximus, which was the first and largest sports arena in Rome. This iconic venue, the site of many a chariot race and athletic contest, still holds its oblong shape and is now a public park. Your tour concludes in the serene residential area of Aventine Hill, where you can contemplate the Glory of Ancient Rome as you take in the beautiful trees, scenic gardens, and an incredible view of the city.